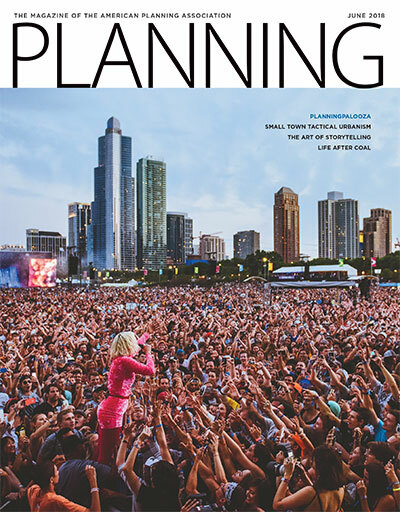 In June, Planning tells a range of planning stories. Read about the challenges facing cities that host massive summer music festivals like Lollapalooza (Chicago) and Coachella (Indio, California); rural West Virginia communities that are struggling to reinvent themselves in a post-coal economy; and planners working with tactical urbanists in small and mid-sized towns who often are able to do what local governments cannot — find and execute creative, speedy solutions to small-scale planning problems. Lindsay Nieman hits the music festival scene to find out what happens when big events come to town. Sidebar by Kristen Pope. A closer look at tactical urbanism on Main Street, by Brian Barth. Appalachian coal communities try to move beyond their mining past. Allen Best reports from West Virginia. Smaller places are using tactical urbanism strategies to stretch rules and dollars — all with the city’s blessing. Brian Barth reports. In this Business of Planning article, Jay Walljasper extols the virtues of a well-told tale — and offers six strategies to make yours memorable. Member highlights, NPC18 recap, APA news. Climate refugee update, stormwater management, cybersecurity. On being an expert witness. Reid Ewing highlights work in APA's research centers. Suburbs, planning careers, urban lighting. Netflix docuseries, PC game, curb data. Cover: Photo by Roger Ho/Lollapalooza 2017.